A safety bicycle (or simply a safety) is a type of bicycle that became very popular beginning in the late 1880s as an alternative to the penny-farthing ("ordinary") and is now the most common type of bicycle. Early bicycles of this style were known as safety bicycles because they were noted for, and marketed as, being safer than the high wheelers they were replacing. Even though modern bicycles use a similar design, the term is rarely used today and may be considered obsolete. The term safety bicycle was used in the 1880s for any alternative to the penny-farthing. The front and rear wheel were not necessarily the same size. Later historians began to use the term in a more restricted way, for the design that was a direct ancestor to most modern bicycles. 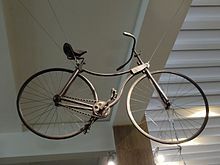 "Diamond frame" is also sometimes used as a term for safety bicycles, even though this technically only refers to a certain type of safety bicycle. The retronym "upright bicycle" is used to distinguish the style from recumbent bicycles. 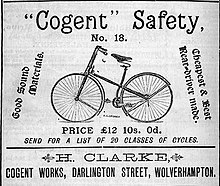 The first bicycle to be called a "safety" was designed by the English engineer Harry John Lawson (Henry Lawson) in 1876, although other bicycles which fit the description had been developed earlier, such as by Thomas Humber in 1868. Unlike with penny-farthings, the rider's feet were within reach of the ground, making it easier to stop. The pedals powered the rear wheel, keeping the rider's feet safely away from the front wheel. The original treadle bicycle model used treadles to transfer power to the rear wheel, while the later 1879 model used a chain drive, an important new technology that had previously only been used on tricycles. Lawson's safety failed to catch on, perhaps due to its increased cost, weight and complexity compared to the penny-farthing. One other variation that appeared at about the same time is the dwarf, exemplified by the Kangaroo, and with a chain-driven front wheel. By 1885, the safety bicycles cataloged in Henry Sturmey's Indispensable Handbook to the Safety Bicycle included seven with lever front-drives, 44 with geared front-drives, and only nine with chain rear-drives. In that same year, John Kemp Starley (J. K. Starley) came out with the first commercially successful safety bicycle he named the Rover. The first modern bicycle, it was heavier and more expensive than penny-farthings, but lighter and cheaper than tricycles of the day. In its original form it used indirect steering, later direct steering was adopted and the bicycle proved to be a hit. The Overman Wheel Company, founded 1882, was the first manufacturer of safety bicycles in the United States, in their factory complex in Chicopee, Massachusetts. Following their creation in England, Overman rushed a safety bicycle to production before the end of 1887. Overman was known for making all-steel bicycles with no cast metal parts. The Overman Victor bicycle was said to be of higher quality and lower weight than other bicycles of its time. By 1893, the Overman factory made the complete bicycle, including tyres, saddles, rims, etc. The safety bicycle was a big improvement on the previous penny-farthing design which it replaced. The chain drive, coupling a large front sprocket (the chainring) to a small rear sprocket (the sprocket) to multiply the revolutions of the pedals, allowed for much smaller wheels, and replaced the need for the large, directly pedaled front wheel of the penny-farthing. The smaller wheel gave a harsher ride; once pneumatic tyres were developed and replaced the previously used solid ones, this disadvantage was no longer an issue. With the centre of mass low and between the wheels, rather than high and over the front hub, the safety bicycle greatly diminished the danger of "taking a header" or long fall over the handlebars. This made braking more effective and cycling, previously the reserve of spry, daring young men, safer, and therefore much more popular, especially for women. Compared with the tricycles of the time, popular with riders less willing to take risks, the safety bicycles were lighter, mechanically more simple, and less expensive. Safeties are now characterized by having two wheels of identical – or nearly identical – size, and a chain-driven rear wheel. The most popular form of the safety bicycle frame, consisting of two triangles, is known as a diamond frame. A similar but different frame used in safety bicycles is the step-through frame. Despite the enormous variety of modern bicycles, recumbent bicycles are the only major variety of bicycle which do not use this same basic design. ^ Brown, Sheldon. "Sheldon Brown's Bicycle Glossary". Retrieved 26 September 2009. ^ Simpson, John & Weiner, Edmund (1989). Oxford English Dictionary (2nd ed.). Oxford University Press. ISBN 0-19-861186-2. Former name for the type of bicycle now in use, differing from the ‘Ordinary’ in the lower position of the saddle, whereby greater safety is afforded to the rider. ^ a b Berto, Frank J.; Ron Shepherd; et al. (2008) . The Dancing Chain: History and Development of the Derailleur Bicycle (3rd ed.). San Francisco, CA, USA: Cycle Publishing/Van der Plas Publications. pp. 37–38. ISBN 978-1-892495-59-4. Retrieved May 30, 2017. ^ a b Berto, Frank J.; et al. (2016) . The Dancing Chain: History and Development of the Derailleur Bicycle (5th ed.). San Francisco, CA, USA: Cycle Publishing/Van der Plas Publications. ISBN 978-1-892495-77-8. Retrieved May 30, 2017. ^ a b Herlihy, David V. (2004). Bicycle: the History. Yale University Press. pp. 216–217. ISBN 0-300-10418-9. In 1876, the British engineer Henry J. Lawson proposed a new rear-drive machine he called the Safety Bicycle. ^ "Icons of Invention: Rover safety bicycle, 1885". The Science Museum. Retrieved 2010-06-05. ^ Tony Hadland & Hans-Erhard Lessing (2014). Bicycle Design, An Illustrated History. MIT Press. pp. 160–161. ISBN 978-0-262-02675-8. The most famous of the rear-drive safeties introduced in 1885 was the Rover, produced in Coventry by John Kemp Starley. ^ Herlihy, David V. (2004). Bicycle: the History. Yale University Press. pp. 235–240. ISBN 0-300-10418-9. ^ a b c Davies, William T. (1897). The New England States, their Constitutional, Judicial, Educational, Commercial, Professional, and Industrial History (Volume I ed.). Boston: D.H. Hurd & Co. pp. 414–418. Retrieved 8 February 2016. ^ Herlihy, David (2004). Bicycle: The History (1st ed.). New Haven, CT: Yale University Press. pp. 214–245. ^ Bolder, Ben (29 July 1893). "The Bicycle Industry (from Scientific American)". Valley Falls, Kansas: The Farmer's Vindicator. p. 3. Retrieved 8 February 2016. ^ "Ideal Tire Sizes by Jobst Brandt". www.sheldonbrown.com. Retrieved 10 April 2018. ^ "Sheldon Brown's Bicycle Glossary Sa - So". www.sheldonbrown.com. Retrieved 10 April 2018. ^ Herlihy, David V. (2004). Bicycle: the History. Yale University Press. p. 225. ISBN 0-300-10418-9. ...it not only prevailed as the universal bicycle style, it also triggered an unprecedented world-wide demand that culminated in the great boom. Rover safety bicycle often thought of as the icon of safety bicycles.